Warning: If you're not a fan of glitter or sparkle turn away now. 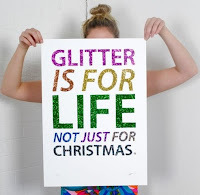 Personally I like sparkle 365 days a year, but during the holidays I think you have the perfect excuse to pile it on! 5. Milani Jewel FX in gold, silver or gems. These colors are awesome and CHEAP!! You'll need three or four coats to get full coverage, but I prefer to use them over another color. The Milani Gold FX looks awesome over China Glaze Midnight Kiss! 4. Dorothy, Who? by China Glaze. Um....so I found this on Amazon for a quarter. A quarter! You basically only pay shipping. You can also get it at Sally Beauty Supply. This is a medium-dark blue packed with sparkles. Loves!! 3. Stairway to Heaven by Deborah Lippmann. This color is an icy white base with white and iridescent white chunks of glitter. You can get good coverage by putting on four coats, but I prefer two coats over Snow White. 2. Leighton by Julep, with Vanessa layered on top of an accent nail. You can buy them individually, but why not pay a little more and get them in the Silver Belles pack* along with another awesome color? Leighton is a shiny silver, and Vanessa is a gorgeous top coat packed with silver and white sparkles. I wore it on my ring fingers as "accent nails" So festive and pretty! 1. Misletoe Kisses by China Glaze. This is a medium green base filled with dark green glitters. Two coats gives you extra coverage, just be sure to use a base coat to avoid possible nail yellowing. Now, glitter polish is a huge pain to take off, but here's what works for me: I soak my nails in pure acetone for about five minutes. The glitter comes off pretty easily after that. I make sure to wash my hands really well, and then use cuticle oil and hand cream so that the acetone doesn't dry me out. Come back next week for my Top 5 Nail Polishes for Winter! *I received the silver belles set from Julep for consideration. All opinions are 100% my own - these truly are some of the best nail polishes I have ever found! LOVE that poster - YES to glitter for LIFE!! p.s. guess what (finally)came in the mail yesterday! !- I LOVE it! !- thank you! 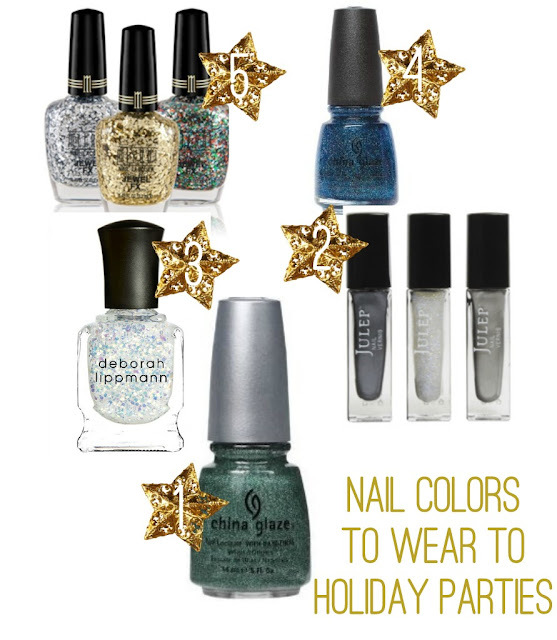 Oh, these look so festive and fun!! LOVE the idea of an accent nail... how have I never thought of this?? (To remove glitter polish, Angie Mae, I actually keep an old washcloth around. The texture helps loosen up the glitter pieces.) I, too, love the poster. I also once saw the quote, "This little girl was born with glitter in her veins." PERFECTION! these are amazing!! i really need to get better about my nails. i live in clear polish (except my toes) and really need to start making it a priority! yours always look so good! !